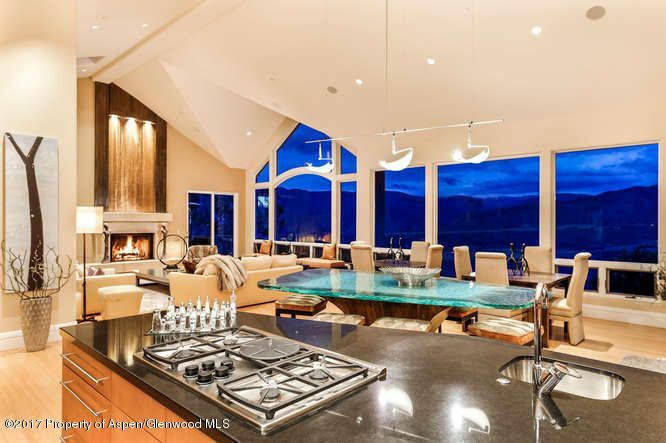 Aspen Luxury Home for Sale | Aspen Snowmass Real Estate :: McKinley Real Estate Sales, Inc. Situated overlooking Brush Creek, just outside Aspen, Eagles Nest is a truly unique piece of Colorado. With two acres of manicured landscaping, enjoy the 360-degree views from indoors and out. Floor to ceiling windows allow you to take in the view of Independence Pass, Aspen’s ski areas, and the surrounding mountains. This four bedroom Aspen home features a spa room with a steam shower, sauna, hot tub & exercise area. The 1,000 bottle wine cellar keeps all of your favorite vintages close at hand. The media room includes a custom bar and mini appliances.